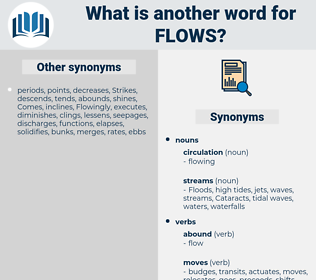 What is another word for flows? move, moves, streams, movement, Movements. flowing, inflow, inflows, workflow, flux, fluxes. 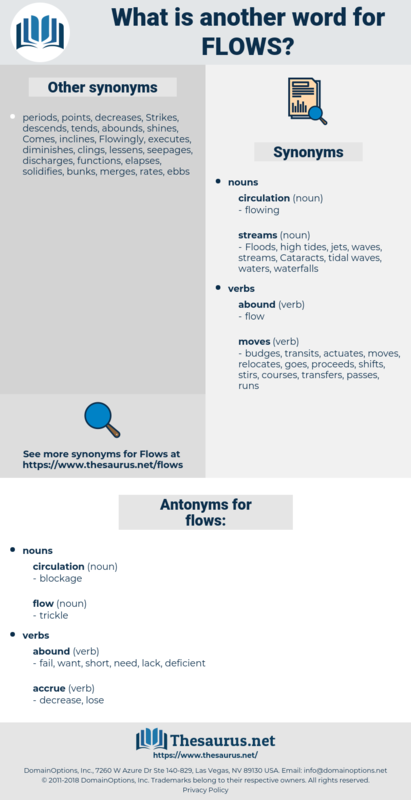 outflows, workflows, Floods, influxes, discharges, runs, flowing, inflows, fluxes. disbursement, Remittances, direction, developments, installments, evolve, chaozhou, exterior, external, Deutsche, entitlement, entitlements, cross, chao, objects, contracts, outer, outdoor, changed, outside, field, tide, TIDES, payment, payments, youth, lists, circulation. fluctuations, circulations, communications, watercourses, conditions, circulates, investissements, transfer, transfers, transmission, allocations, supplies, displacements, volume, volumes, coulees, available, dynamics, waters, Trafficking, considerations, loads, flaws, loadings, migrations, outlets, consignments, Deliveries, outputs, destinations, Investments, Expenditures, redeployments, Resources, mouvements, relationships, waterways, potentials, crossings, fleets, directions, interchanges, operations, Quantities, perspectives, channels, contributors, infusions, distributors, transitions, relations, immigration, statistics, interactions, proceeds, components, requirements, Pumping, contributions, influences, foreigners, shortcomings, collections, connections, dealings, Routing, organisations, filling, sources, governance, pressures, Frequencies, shipments, flights, deliverables, assets, finances, passages, reductions, implications, receipts, injections, fonds, transmit, exchanges, commitments, roads, outcomes, procedures, courses, applications, elements, Rivers, persuasions, capitals, assistance, establishments, LAVAS, happens, switches, converts, sharing, stocks, entrances, networks, input, inputs, loans, arrivals, Travels, gradually, admissions, cycles, terms, earnings, Deficiencies, revenues, levels, ways, routes, funds, waves, contacts, groupings, effluent, effluents, leaks, mechanisms, disadvantages, increases, highways, exports, Refugees, assignments, Associations, arrives, upheavals, swings, discussions, shifts, intakes, FDI, offset, undertakes, Activities, submissions, immigrants, Tendencies, numbers, dispatch, dispatches, imports, Outbreaks, investors, Vehicles, traditions, Workshops, amounts, patterns, direct, inlets, fonts, Schools, castings, mailings, benefits, feeds, curves, Incomes, exoduses, swaps, weaknesses, Journeys, Records, visitors, listings, gates, factions, circuits, additions, arriving, Houses, drafts, lessons, yields, Entries, Ones, insights, sorties, conducts, entrants, parts, gutters, crowds, opinions, PATHWAYS, Gestures, demands, exits, Migrants, Forms, actions, tours, faiths, settlers, fits, Paths, problems, sinks, features, Categories, LANES, spells, cattle, Subsidies, places, avenues, speeds, Strains, trades, shades, bull, processes, Grants, expenses, data, Charges, markets, nets, aspects, slides, defects, passes, experts, Fees, groups, 1990s, reaches, vents, Tracks, Mains, Remedies, figures, belts, views, leads, aliens, gaps, tickets, Countries, Classes, rounds, careers, strands, visits, posts, assists, seas, teachings, strong, needs, ties, trips, PUBS, Ideas, teams, trains, stages, Remittances, LINEs, developments, contracts, TIDES, lists. follows, originates, allocates, drains, exists, circulates, source, folds, transmits, throw, throws, operates, contributes, involves, reflects, penetrates, transfers, walks, occurs, releases, emanates, Leaves, explains, derives, transits, transpires, looks, crosses, shows, holds, sweeps, results, continues, spills, Addresses, suggests, applies, falls, spreads, indicates, belongs, springs, establishes, implies, responds, lies, depends, maintains, creates, Empties, controls, builds, relates, arises, relies, elapses, extends, tosses, targets, becomes, ends, lays, transitions, deducts, appears, rolls, stores, proceeds, covers, pounces, okay, des, contributions, entails, provides, rises, emerges, returns, offers, spends, requires, wishes, enters, aims, drops, begins, Comes, uses, exchanges, turns, brings, stems, dumps, causes, saves, happens, switches, converts, inputs, sells, Travels, casts, Les, starts, Drives, hits, finds, increases, arrives, Rests, sets, discussions, shifts, intakes, hinges, goes, heads, amounts, Entries, puts, conducts, keeps, PATHWAYS, sinks, Faces, stands, takes, meets, trades, passes, reaches, gets, leads, tickets, 's, dates, runs, makes, sheds, circulation. fail, want, short, need, lack, deficient. That flows into Bill Williams Fork, does it not? Mother, don't you remember, the city is built on sand banks, and the sea flows between?